The Chinese PV market is booming -- GTM Research expects installations to grow upwards of 75 percent to 7.9 gigawatts in 2013, from 4.5 gigawatts in 2012. With the traditionally large markets of Europe facing incentives cuts and declining installation levels, suppliers are differentiating across growth markets in order to find a pipeline for their product. As the market dynamics shake out, it remains to be seen which manufacturers are most apt to benefit. In this series, we’re focusing on some less prominent global supply chain trends by sharing a selection from GTM Research’s Global Competitive Intelligence (CI) Tracker. Here, we highlight what role the domestic market plays for various Chinese suppliers. On the whole, the megawatts shipped to China have grown substantially since the beginning of 2011. The Chinese government has helped to drive the influx of domestic solar development, calling for 40 gigawatts of solar by the end of 2014 through its Twelfth Year Plan, a goal which is furthered by installations awarded under the Golden Sun program. As China is increasingly becoming a market of consequence in the global landscape, we’ve seen mixed results from domestic PV suppliers with regard to how successfully they have capitalized on this growth. This is evidenced by comparing the portion of revenues attributed to the Chinese market by firms in Q3 2012. 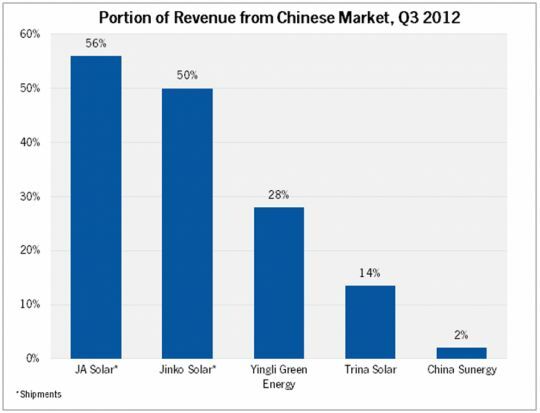 Comparing Chinese manufacturers, we see that JA Solar and Jinko Solar were especially active in the domestic market, while Yingli Green Energy, Trina Solar, and China Sunergy derived the majority of their revenue from foreign markets. The difference in numbers across producers is reflective of suppliers’ varying domestic participation strategies. JA Solar’s domestic shipment levels have traditionally been high due to the company’s cell business. As the firm has increased its participation in the module business, JA has adopted an “integrated approach” in China. JA partners with utility companies, EPC firms, and independent power producers (IPPs) including China Power Investment Corporation (CPI). Volumes sold domestically more than doubled from the second to the third quarter of last year, and JA is guiding continued growth in the China market moving into 2013. While JA Solar currently functions primarily as a product supplier in China, Jinko Solar has expanded its participation in the domestic market to include project development and EPC work, partnering with state-owned enterprises (SOEs) such as China Three Gorges New Energy Corp., GSHHSD, and the Jinchuan Group. With the Chinese Energy Administration and Chinese Financial Ministry announcing support of distributed PV systems, Jinko seeks to increase the scale and profitability of its downstream business. Yingli Green Energy has steadily increased its portion of revenue attributed to the domestic solar market through its involvement in the Golden Sun Program. In 2012 the company signed 288 megawatts of modules, making it the leading supplier to the program. Rounding out the year, the company grew its Chinese revenue by 16 basis points, from 28 percent in the third quarter to 44 percent in the final quarter. As the Chinese government continues support for PV development activities, this relationship will bolster Yingli’s involvement in the domestic market. The Chinese market played a less significant role for both Trina Solar and China Sunergy in the third quarter. However, both suppliers have noted the importance of the domestic market going forward. Trina Solar has entered into framework agreements with local municipal governments for multi-year power plant development projects in all four of its commercial operating regions, to commence in 2013 and 2014. China Sunergy claims to be pursuing projects in Northeast China, but is also devoting significant resources to the European market, particularly Turkey. We’ll continue to monitor the transition to China as a market of consequence for domestic suppliers, but in the meantime, we see two key trends. First, the Chinese market is very price sensitive, so lower-cost manufacturers are apt to be most successful. Yingli and Jinko have traditionally been on the lower end of the cost spectrum and consequently have been able to ship a significant portion of their megawatts domestically. 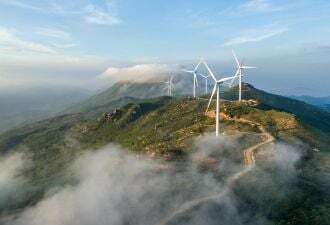 Second, as China’s National Energy Administration continues to support the development of solar capacity, partnership with government agencies, municipal authorities, and SOEs can create a captive domestic pipeline. 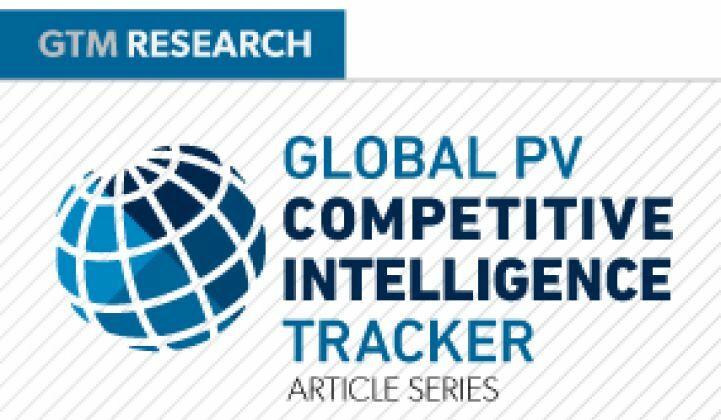 We’ll be covering additional important but less-than-obvious trends about the global PV supply chain next time in Part IV. In the meantime, check out GTM Research’s Global CI Tracker. Join us at Greentech Media's Solar Summit on April 22-24 for further discussion of Chinese market dynamics!